Almost three weeks ago, Mike, Luella, and I boarded a plane for Greenville, South Carolina and embarked on our muggiest adventure yet: a month in the Southeast. We made it through a full day of flying, a 1:00 a.m. Uber trip to Wal-Mart for snacks (and terrible, terrible beer), and settled in to our Airbnb STILL LIKING EACH OTHER AND EVERYTHING. Since then, we’ve driven through the Blue Ridge Mountains to Asheville, North Carolina and then to Chattanooga, Tennessee where we are now planted while Mike works for a couple of weeks. 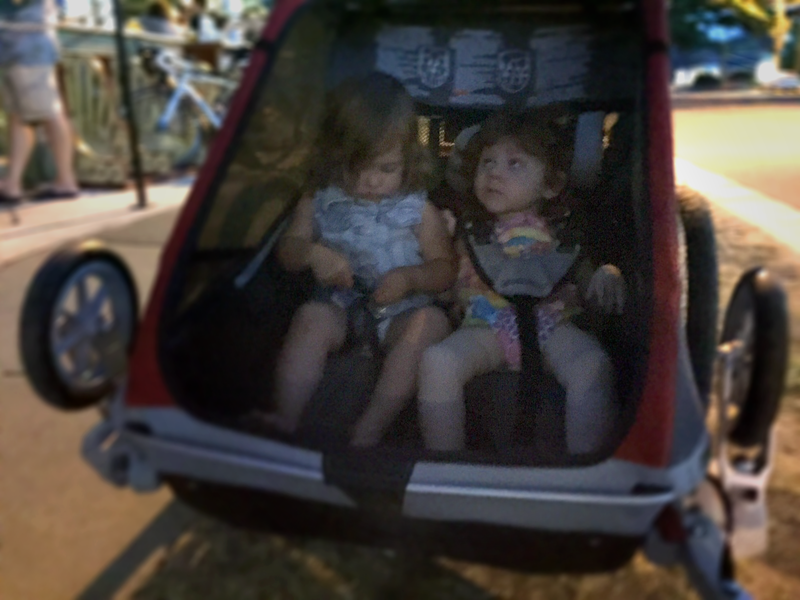 Luella has proven herself a worthy traveling companion, contently sleeping on the floor of our 375-square-feet apartment and riding in her stroller through what any bona fide Pacific Northwesterner would describe as “an actual inferno”. 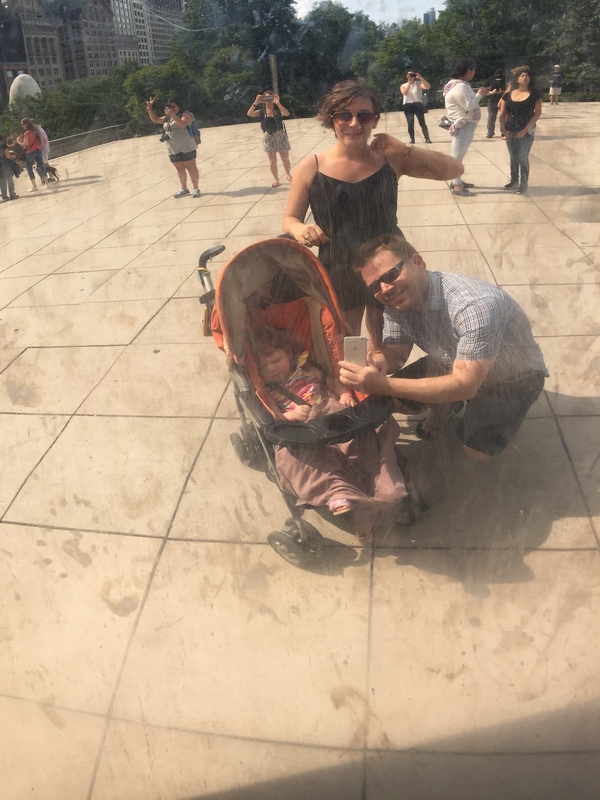 Luella has also been amenable to spending her days doing mostly atypical kid activities, and so we’ve been thrilled to be able to visit 7 breweries, a Monet exhibit, and a couple of live music shows. 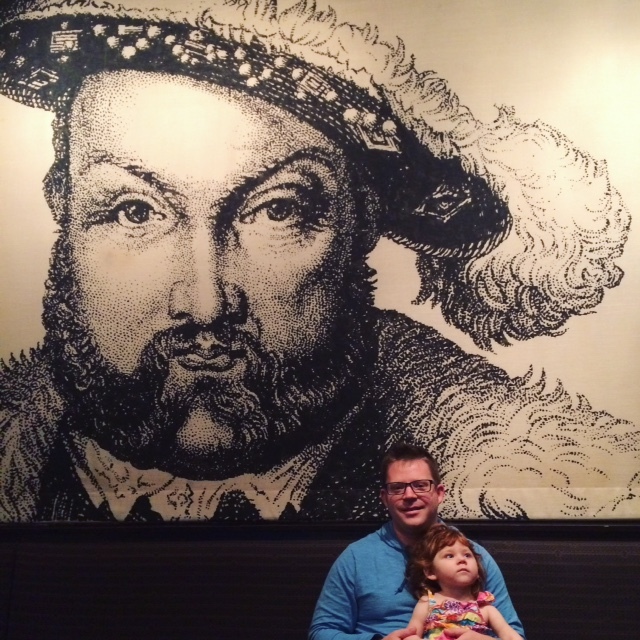 In truth, we don’t do a lot of kid-centric outings when we’re at home, either. Library storytimes and swimming at the community pool are the notable exceptions, although I still consider them only mild successes. But her first playgroup—for children with developmental delays, no less—was a complete failure, culminating in the children and adults running out to the playground en masse, abandoning us alone inside with a book (we like to read at home, but without social ostracization…or pants). The truth is, Luella usually doesn’t care or notice much whether we’re doing “kid things.” Sometimes I still try, but I feel twinges of guilt when I realize I’m doing it more for my benefit than hers. I’m cautious of trying to mold Luella into someone she’s not, turning her into a prop while I pretend to be playing at a more typical motherhood. 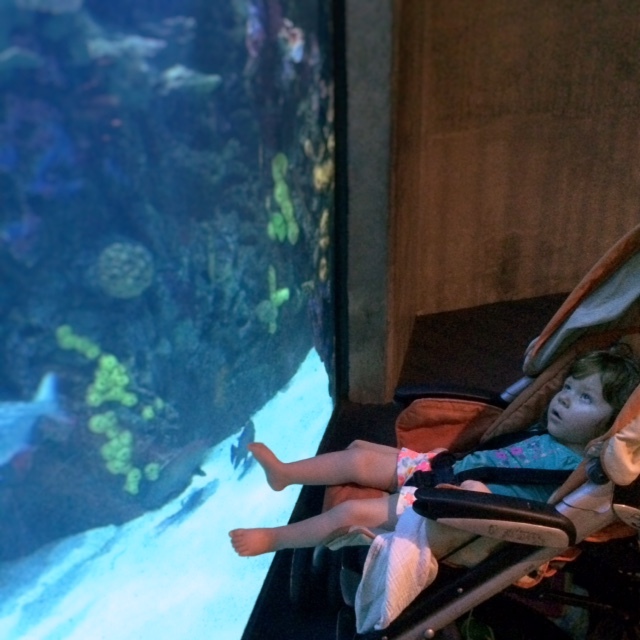 So when we arrived at Chattanooga’s aquarium and I discovered her napping in the stroller, it was a real quandary: do I go inside, accepting that she probably wouldn’t have noticed much anyway, or wait for another day? I turned around and journeyed back to the apartment (okay, it’s like a 7-minute walk, but you guys, I’M SO HOT), knowing I was fully stepping into “you’re-pretending-she’s-going-to-be-into-this-like-other-kids” territory. When we returned to the aquarium the next day, she was awake. And, despite the fact that I don’t really like fish, turtles, crabs, sharks, or snakes, it was the BEST DAY EVER. As it turns out, the aquarium is an ideal place for people who are sensory sensitive and have cortical vision impairment (and who also don’t experience a crushing anxiety when stuck in a muggy room, surrounded on all sides by a shark-infested abyss). The exhibits were often hushed and dark, except for the water and the slow-moving fish that swam right up to the glass. The jellyfish exhibit, which I might have previously considered a torture chamber, was a particular hit: a completely dark room, black water, and glowing jellyfish. 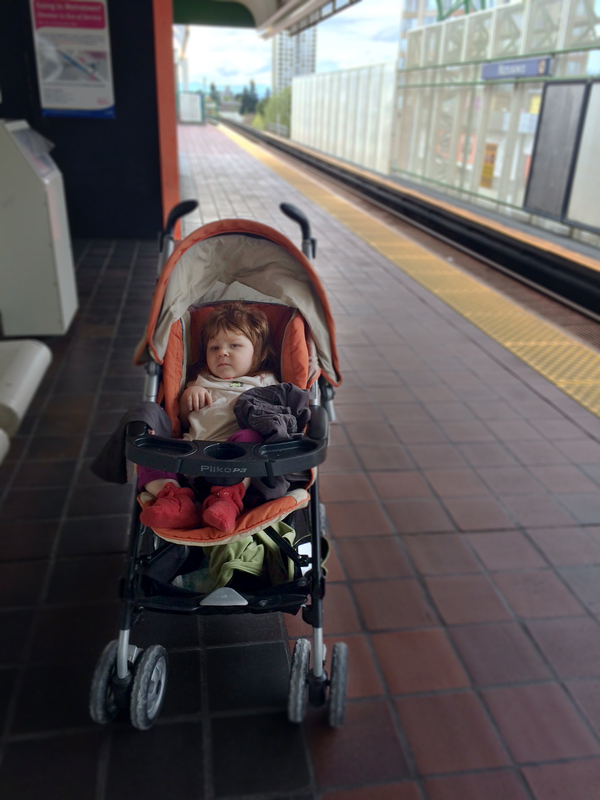 At one point, I pushed Luella’s stroller right up to the aquarium’s glass and sat on a bench behind her. After a few minutes, I sneaked a look at her face, expecting she’d dozed off. But no, there she was: mouth open in awe, eyes concentrated on the swimming fish. I share a lot of time with Luella, but that doesn’t necessarily mean we always have a shared experience. Sometimes I can easily understand what she feels or wants. Other times, especially when we’re in an environment that’s new and stimulating, I’m not sure how aware she is of anything that’s happening around her. 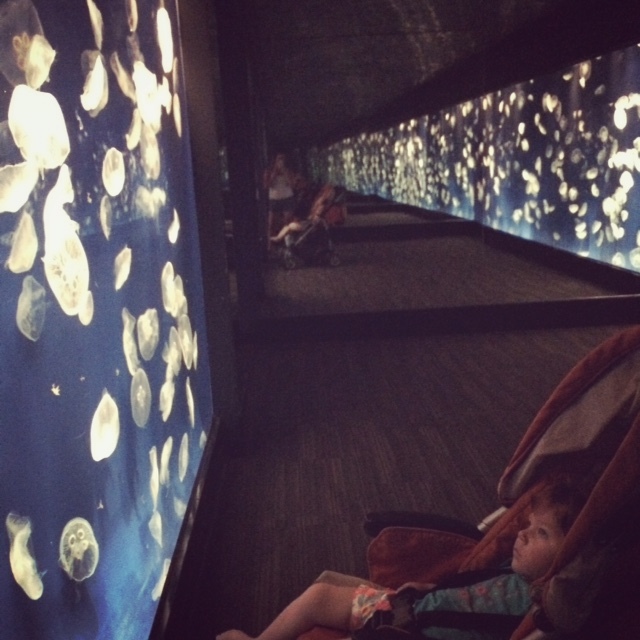 But sitting together at the aquarium, both of us mesmerized by the fish, I realized there was no nagging voice. This was not pretend. This was my daughter and I, experiencing something together. 2,000 miles from home and 20 feet below the surface, we’d found our depth. 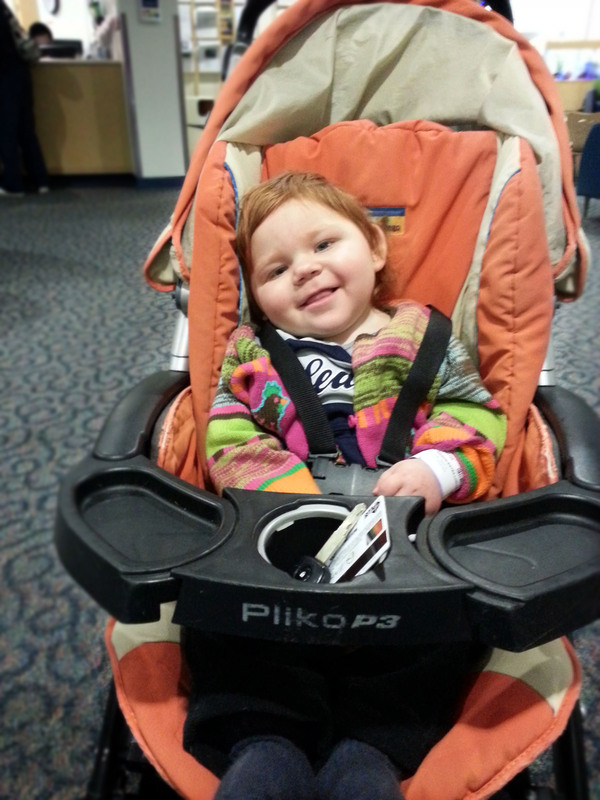 Health Update: Luella FINALLY has her pediatric stander! Her physical therapist will show us how to use it when we get back from vacation and then she’ll have it at home. The stander’s primary role is to help with bone density in her legs. One of our main activities right now is helping Luella to learn cause and effect. Teaching cause and effect involves putting her hand on a switch to trigger a toy’s noise or light. Hopefully, she will eventually understand her role in making the noise/light and begin to do the movement herself. 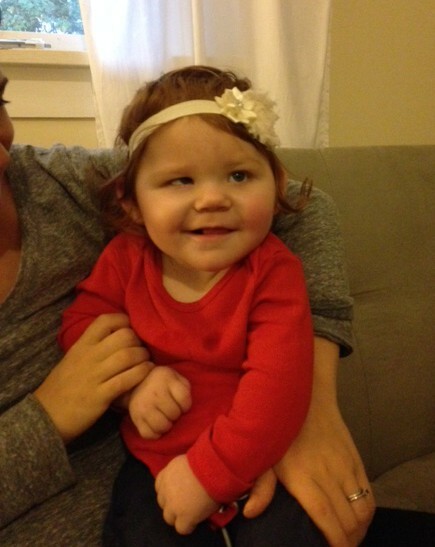 We’ll be looking into getting Luella her first wheelchair soon. Strollers aren’t really enough support, she’s getting heavy, and some of our favorite restaurants aren’t super stroller-friendly. Clearly, benefits abound. P.S. 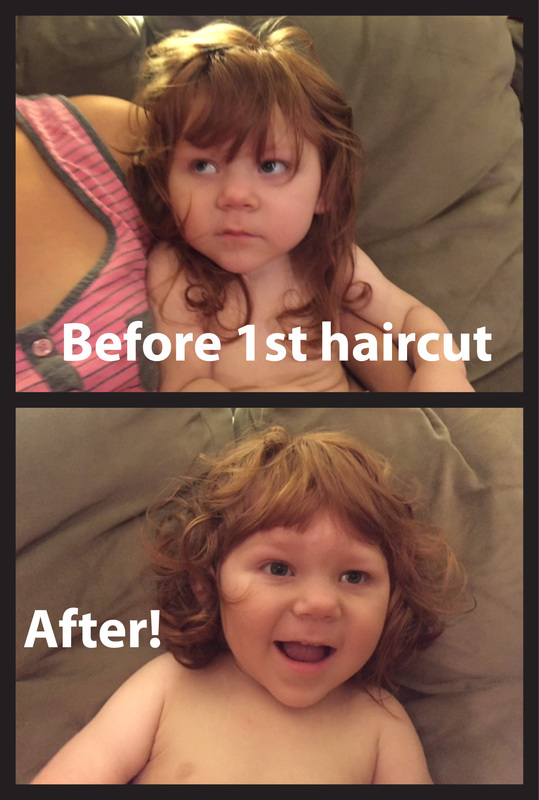 You may have noticed Luella had a haircut! No, that’s not a wig in the before picture. Mike and I were recently driving home from the beach when we passed a large, beautiful garden filled with roses a few blocks from our house. As he explained, the Cornwall Rose Garden has been there since we moved to our house in 2008 and we have passed it, both walking and driving, probably 500 times (upon doing some research, I found that it’s been there since 1916, so MY BAD). Mike and I have long recognized the differences in our literal world views. Whereas I notice people, feelings, and interactions, Mike notices, uh…railway systems? It’s especially obvious when we compare our vacation pictures, which appear to be taken on separate trips: my camera is full of vibrant photos of people and animals, while Mike’s are mostly landscapes and boring still lifes. 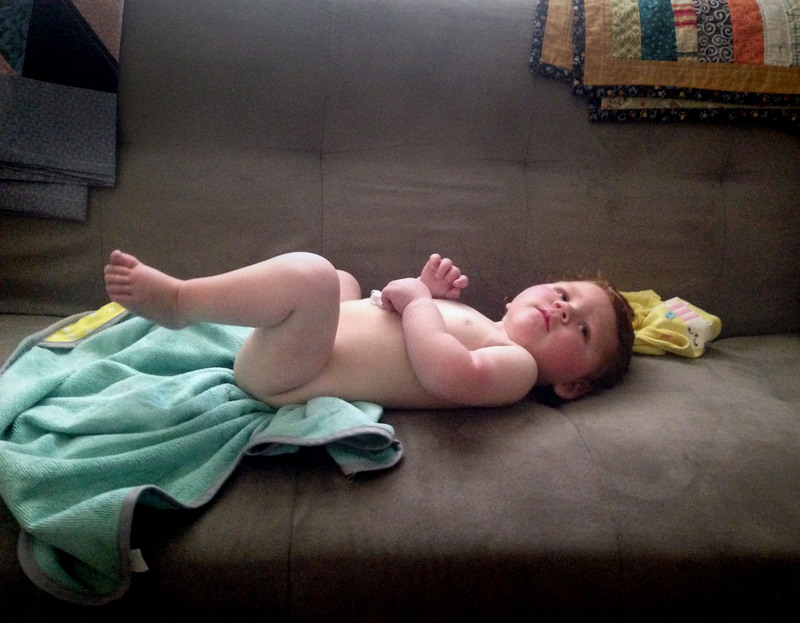 That being said, Mike and I are pretty much aligned on the way we view Luella: as…Luella. 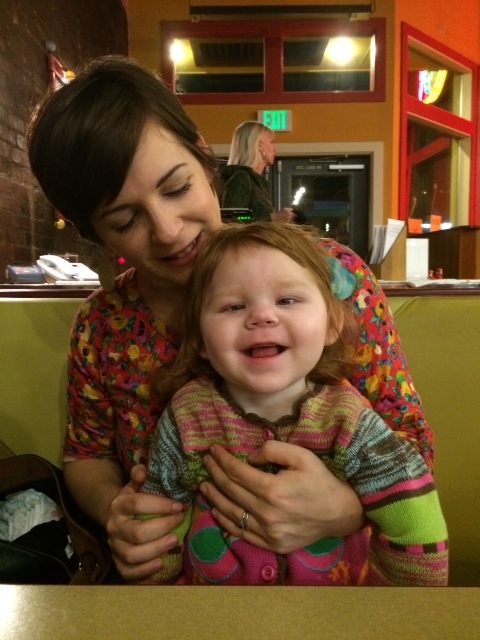 Nevertheless, as Luella gets older our view of her versus other people’s views are growing increasingly disparate. Since most people expect two-year-olds to be able to pretty expertly walk and talk, her disability is becoming more noticeable. There are more stares, more questions, and more impossible conversations about the upcoming “terrible two’s” during which she will apparently “run around the house and scream ‘no’” (spoiler alert: she will do neither of those things at two years old). I’ve been simultaneously dreading and preparing for this shift for a long time. Admittedly, most of my preparation has consisted of imagining myself COMPLETELY ANNIHILATING someone who uses the “R” word to describe her (for no apparent reason I always, ALWAYS envision it happening in the baking aisle of the Meridian Haggen). But for the first time, I WAS bluntly asked, “What’s wrong with her?” which came as a shock (although I may have been more prepared with some bags of powdered sugar around). I’m accepting that we are now firmly in a place we’ll be for a long time, probably forever, where some people will see what’s “wrong” with Luella before they see anything else. There have been many, many occasions when kids have wrongly called Luella a “baby” and no one has corrected them. 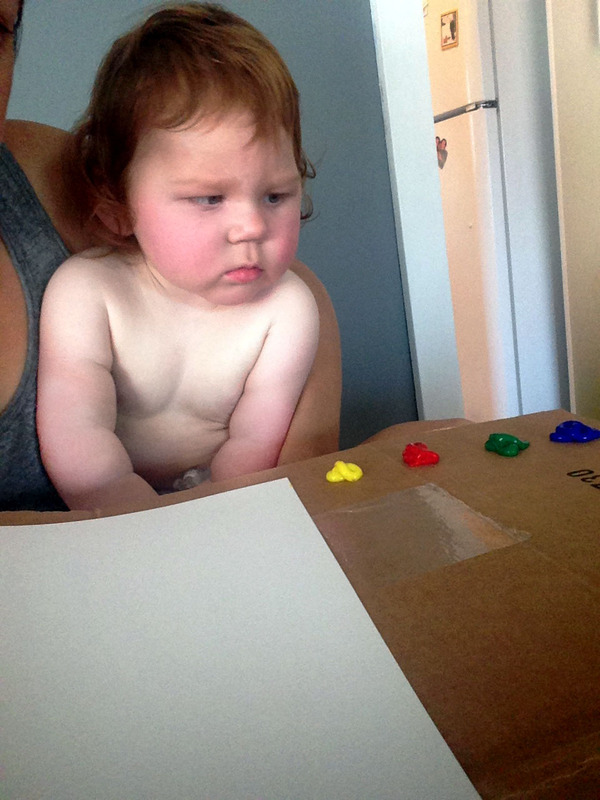 There have been an equal number of times that full-grown adults have talked to Luella in nauseating, widdle baby-waby talk that makes me uncontrollably cringe (and, although it may be my imagination, causes Luella to giving her withering scowl). On the worst days, it sometimes feels like Mike and I are standing alone, watching Luella from some desolate viewpoint. But then there are nights like tonight, when we find that someone is standing right next to us, seeing Luella from the same perspective. And when that happens it’s hard not to notice that while our life isn’t a bed of roses, it’s not exactly a field of cactus either. 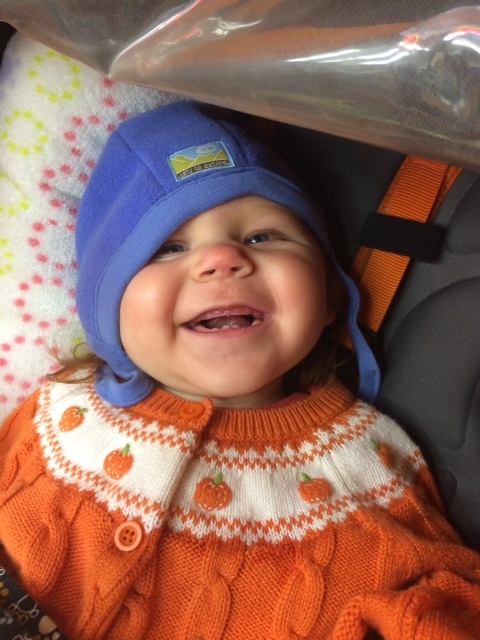 Health Update: After months of dealing with insurance, Luella was partially approved for a pediatric stander, which will allow her to stand up with support. Our physical therapist is continuing to advocate that the ENTIRE stander be approved, including the stupid (and entirely necessary) $600 plastic tray that they refuse to cover. SO. 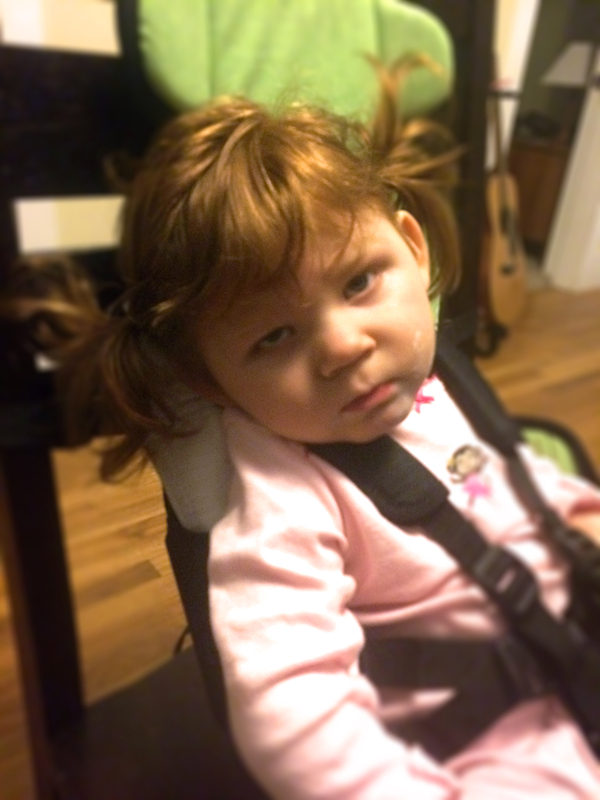 We’re increasing one of Luella’s seizure medications in a further attempt to eradicate her tiny seizures. They’ve decreased, but she continues to have a few an hour. 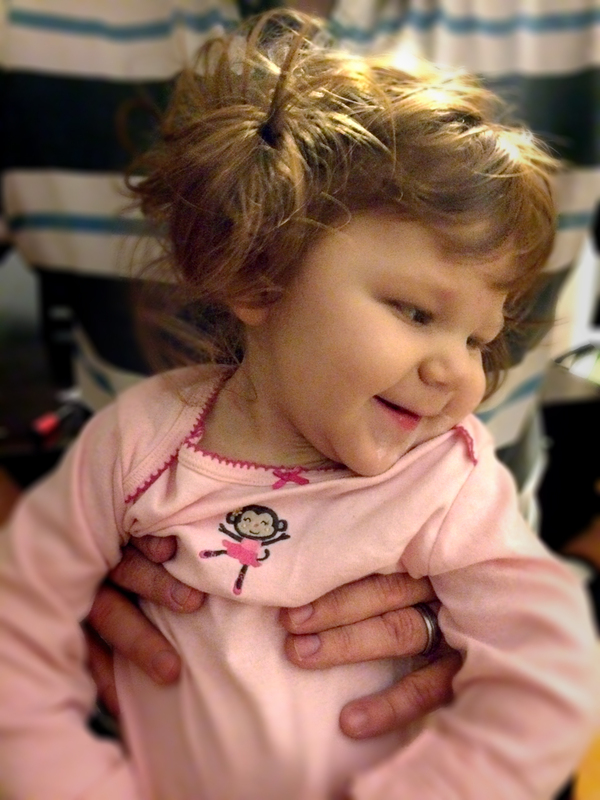 While it’s unlikely that she’ll be end up being seizure-free, we’re working to minimize them as much as possible. We’re still working on oral feeding in therapy and at home, although my motivations for doing it have changed. 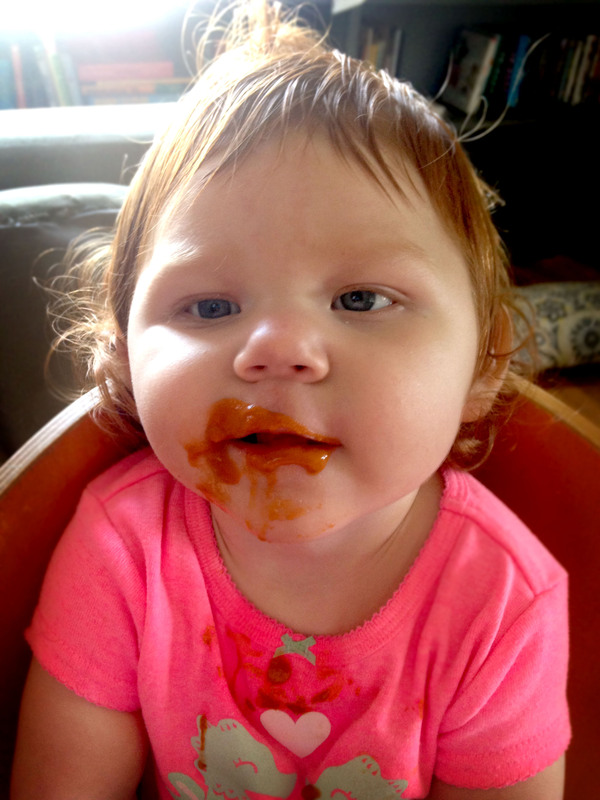 We’ve realized that Luella will likely always need her feeding tube, so after discussing with her feeding therapist, our NEW motivation is helping her to build eating skills so that she can enjoy the sense of taste and participate in food-centered social events, like birthday parties. I love food, parties, and participation, so it’s the only motivation I need to keep trying. Parenting is all about The Schedule. In addition to the typical sleeping/diaper change schedule, Luella is also on a feeding schedule (through her feeding tube every 4 hours and continuously for 10 hours overnight), medication schedule (11 pills, 12 mLs of liquid meds, and a vitamin drop everyday), and weekly therapy schedule (physical, feeding, and occupational). In theory, The Schedule keeps all of Luella’s needs organized and attended to throughout the day. In practice, The Schedule is threatening to seize every last shred of spontaneity from my life. I do not operate very well on schedules. I’m perpetually late. I regularly wear my bathing suit in lieu of more traditional undergarments when I’m behind on my laundry schedule. I don’t plan my meals for the week because I don’t like ANYONE telling what to eat for any given meal, even if that person was a more health- and budget-conscious me, three days ago. 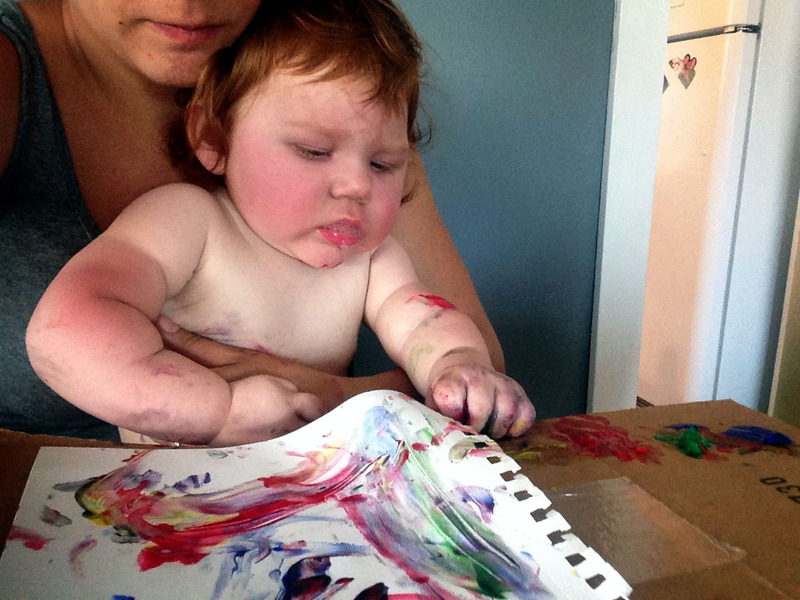 I knew that “I’m attempting to escape the monotony of my day” and “I’m proving to myself that having a child with special needs doesn’t have to be a barrier to acting impulsively” weren’t good answers. “Just going on an adventure!” didn’t fare any better. After a brief interrogation followed by a thorough search of my car and purse, Luella and I were finally let through. We boarded the Skytrain at the nearest station, got off in an unfamiliar neighborhood, ate dinner, and returned home. The whole expedition took less than four hours. 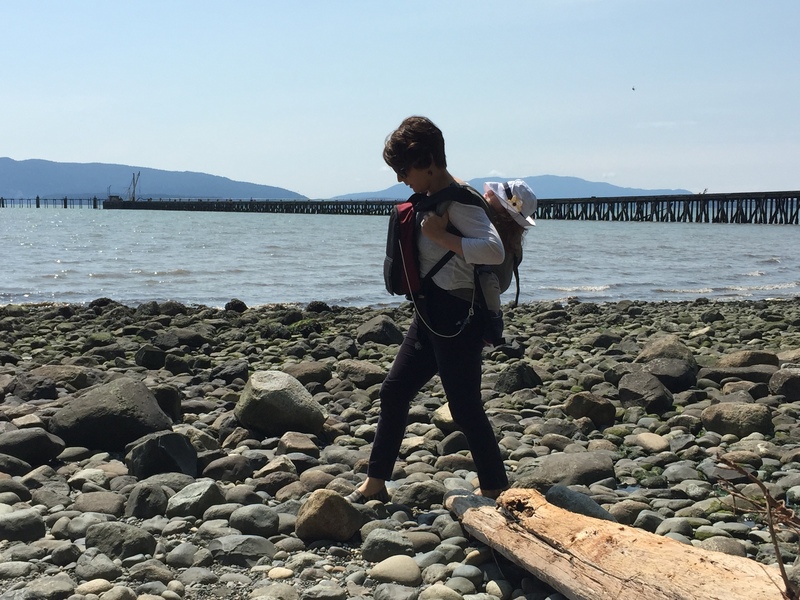 It was an efficient form of therapy: I got back to Bellingham feeling much less like an overscheduled, claustrophobic robot and more like the audacious, breezy mom I had intended to be. I know that I can’t run to Canada whenever I want to avoid The Schedule (my nerves aren’t equipped to handle another interrogation anytime soon), so I’m trying to instill more novelty into my daily life. So far this week I’ve walked an alternate route to downtown, sipped coffee at a different shop, baked a new dessert recipe, and made an impromptu decision to do Trivia Night at our neighborhood brewery. I’ve also lost my car keys, arrived 10 minutes late to a therapy appointment, and let all of my clean laundry wrinkle in the basket. If it didn’t sound so boring, I’d say adhering to The Schedule a little better should be the unorthodox thing I try next week. Health Update: We recently had a round of appointments at Seattle Children’s Hospital and are excited to report that there is nothing exciting to report. 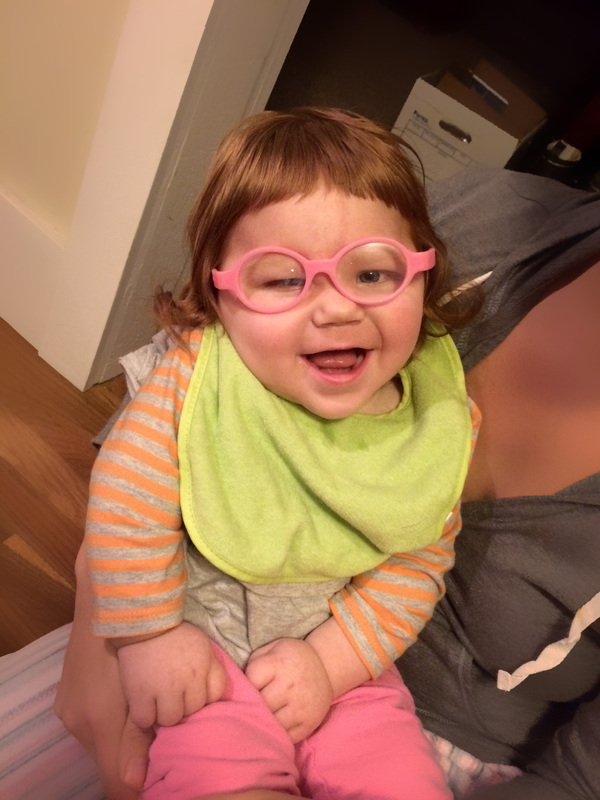 Luella is beginning to work with another specialist through the Birth to Three program to specifically address her Cortical Vision Impairment (visual impairment caused by a brain injury). She, along with her other therapists, will be helping Luella with visual-processing, cause and effect, and decision-making. We also now know that Luella’s vision surgery last year was unsuccessful in giving her binocular vision (eyes that work congruently, rather than one at a time). Because of this, she will never be a professional baseball player or jet pilot, an outcome which I have lost exactly no sleep over. 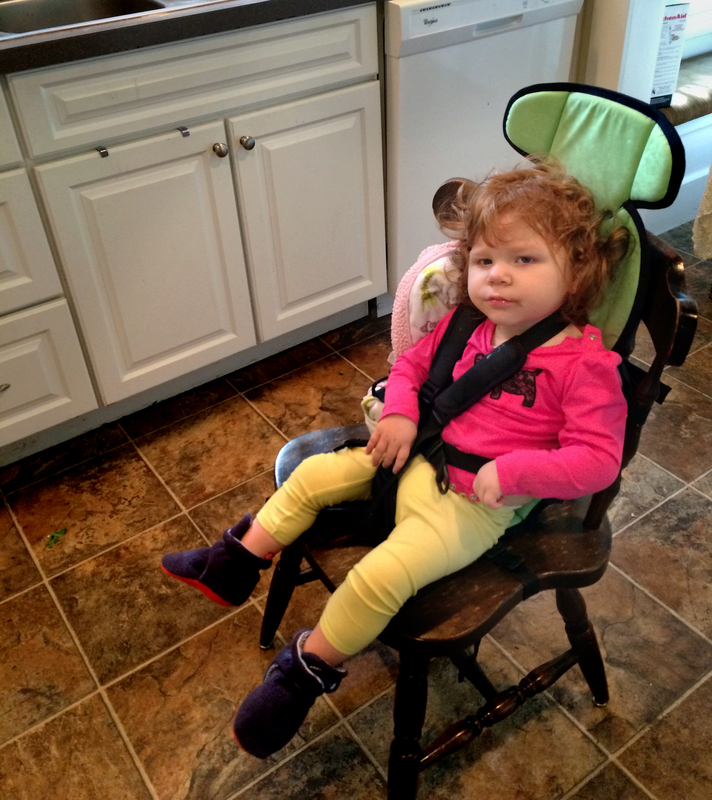 No, we have not heard if we won our GroupHealth appeal for the pediatric stander. Yes, I am still peeved. I could feel it coming for weeks before it finally happened. It started with a late-night Google search: “places to travel with good medical care”. We’re not going to plan a vacation NOW but, I reasoned, there would be no harm in doing some research. The Google searches quickly multiplied: “best hospitals in Central America”, “flying with children”, “lightweight car seats”, “sunscreen for kids”. Soon, I was studying train timetables, flight times, and car rental reviews. I read about Panama’s new subway system (the first in Central America! ), rustic cabins in Wyoming, and a summary of nearly every neighborhood in San Diego. I’m rarely thorough with anything, but travel research? I’m nauseatingly comprehensive. Despite the confines of full-time jobs, Mike and I actually managed quite a bit of traveling before Luella. My favorite destinations were the ones that made my mom squirm (“I’ll be fine, I’ll just take tranquilizers the entire time you’re gone,” she told me before we left for a trip to Uganda), where there was a practical guarantee of traveler’s diarrhea, a challenging language barrier, or at the very least, a brutal red-eye flight. Yes, we’ve also done more comfortable vacations, but I’m a travel masochist at heart. 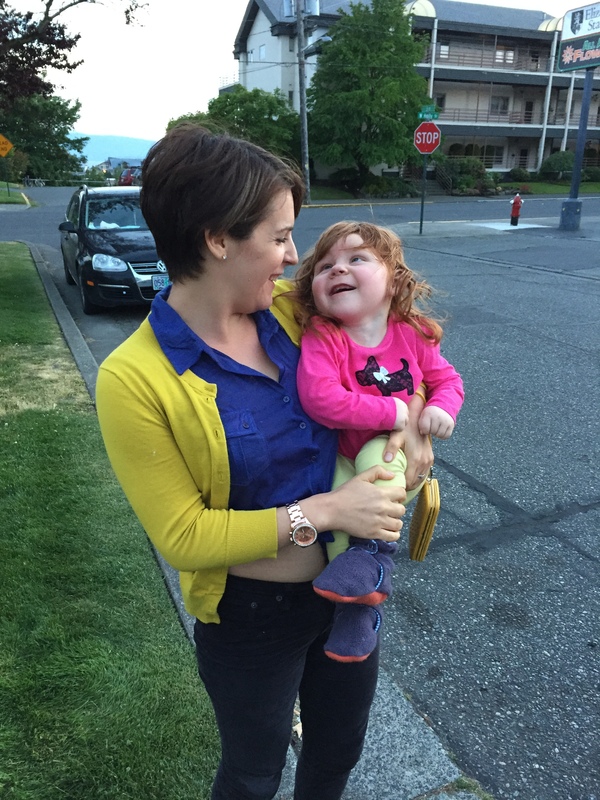 I’ve joked that Luella has the same wild travel bug; after all, she flew in a helicopter to Seattle four hours after she was born. But the truth is, I’m a lot less brave than I used to be. The cocky traveler in me is gone and now included in my Google search is “how safe are taxis in Costa Rica” and “closest hospital to Winthrop”. 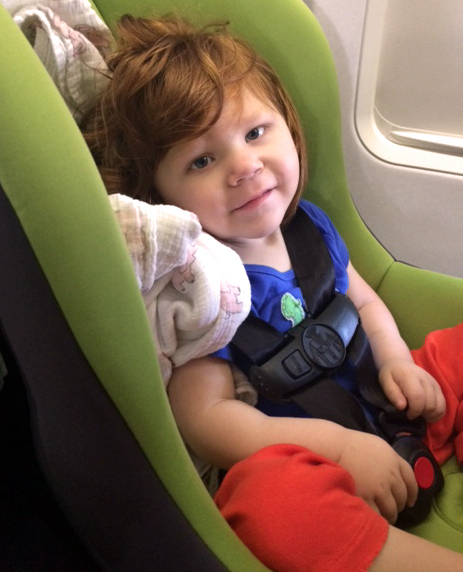 I thought I’d need a little more time to emotionally prepare to take her on a plane, far away from the medical care we know. But the Googling spun out of control and I felt the familiar, relentless urge to buy plane tickets and flee town. 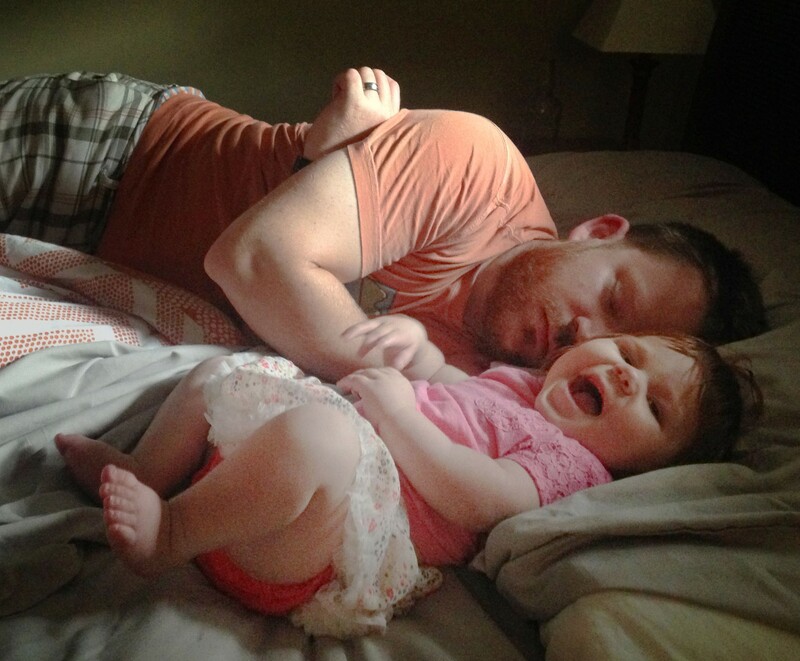 This June, Luella and I will meet Mike in Chicago after his work conference there ends. We won’t be riding on the backs of motorcycles or frantically flipping through a Spanish-English dictionary to find a translation of “my husband won’t be joining me for breakfast, he’s still vomiting profusely”, but it’s the exact level of adventure we can manage at the moment. My initial reaction to realizing I’d be taking Luella on her first flight by myself was “What a fantastically terrible idea!”, quickly followed by “BRING IT ON, SUCKERS”, so beyond the trip itself, I’m also pleased to see that Adventure Jenn is still waiting in the wings (albeit in a slightly tamed-down model). Besides, I’m convinced that Luella will be pleased to spend the 4.5-hour plane ride happily looking at books and snuggling in my lap. And if she isn’t, I’m well-prepared to take my travel with a dose of pain. 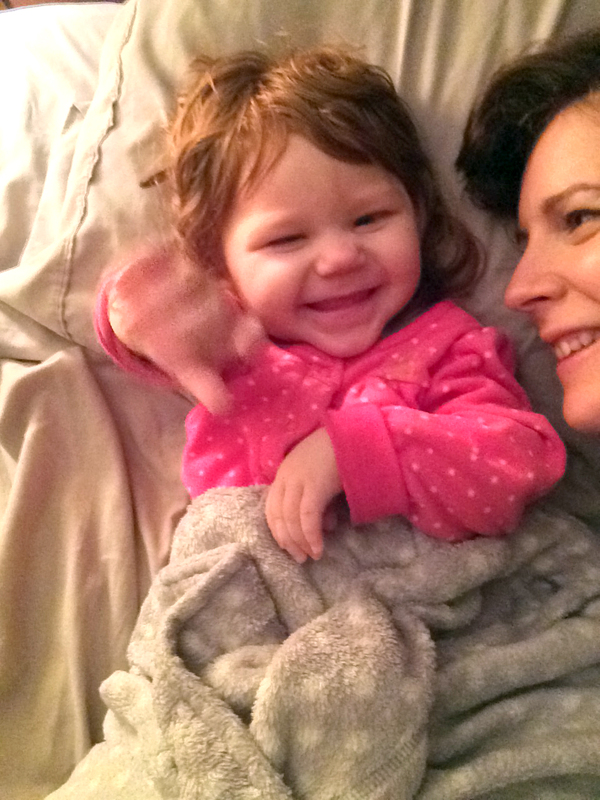 Health Update: Luella is more engaged and animated than ever! 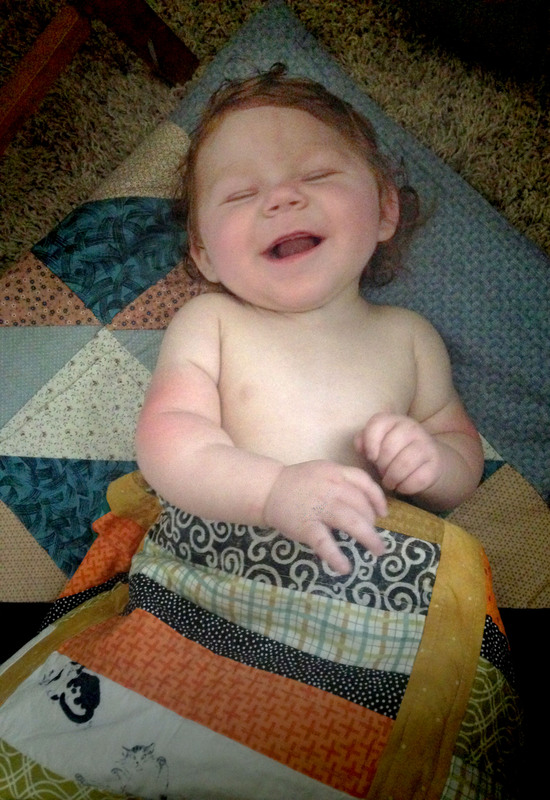 Lots of smiling, cooing, and honk-laughing. Although she still can’t quite sit on her own, her head and trunk control are improving. 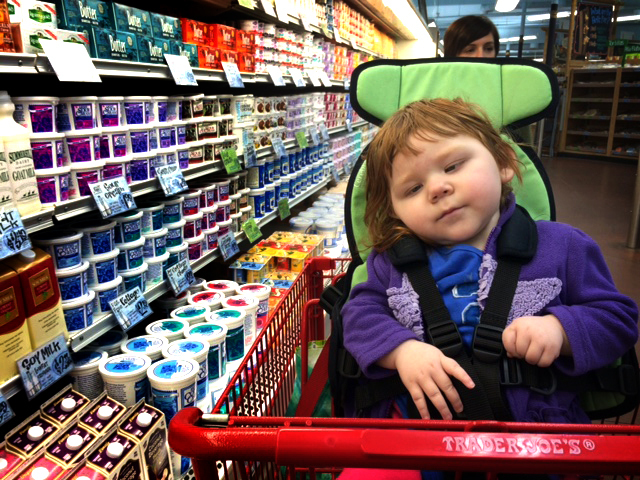 We recently received a special chair for Luella to sit in at the dinner table and in shopping carts which has been important (at least symbolically) for her independence. These types of things are ridiculously expensive and we’re grateful to Sisu Children’s Fund for buying Luella’s chair for her. 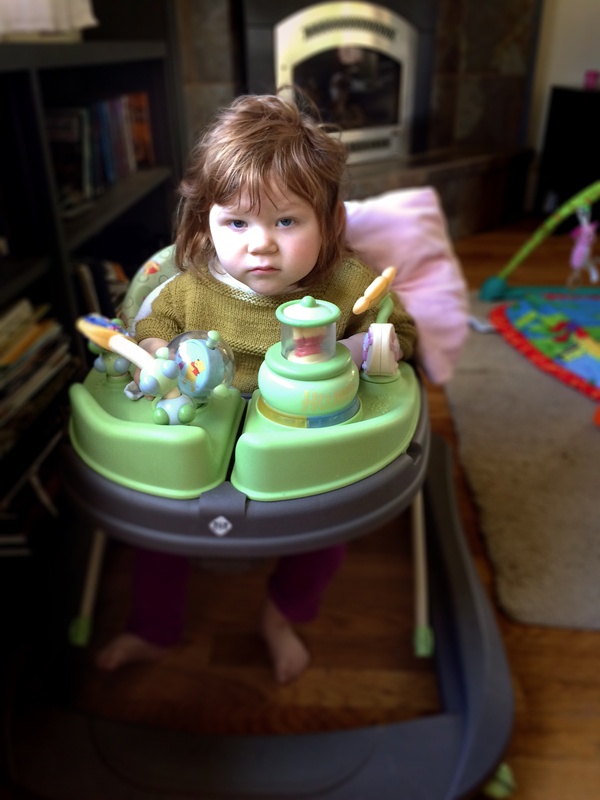 We’re also trying to get a pediatric stander that will help her learn to put weight on her feet, but we’re dealing with Group Health’s nine circles of hell (currently in the appeals process realm), so it might be another few months. On a desperate mission to leave our plagued house a couple nights ago (I believe this was post-ear infection but pre-stomach bug), Luella and I found ourselves perusing the racks at Goodwill. She sat in her stroller while I packed treasured finds around her: $12 leather boots, maternity clothes for a friend, and an entirely unnecessary toddler-sized, fuchsia dance costume (just joking, that was an essential purchase). We hauled our goods up to the counter and the store clerk sneaked a peek Luella and began to chatter away. Here’s the thing: Luella wasn’t tired. THAT’S WHAT HER FACE LOOKS LIKE. 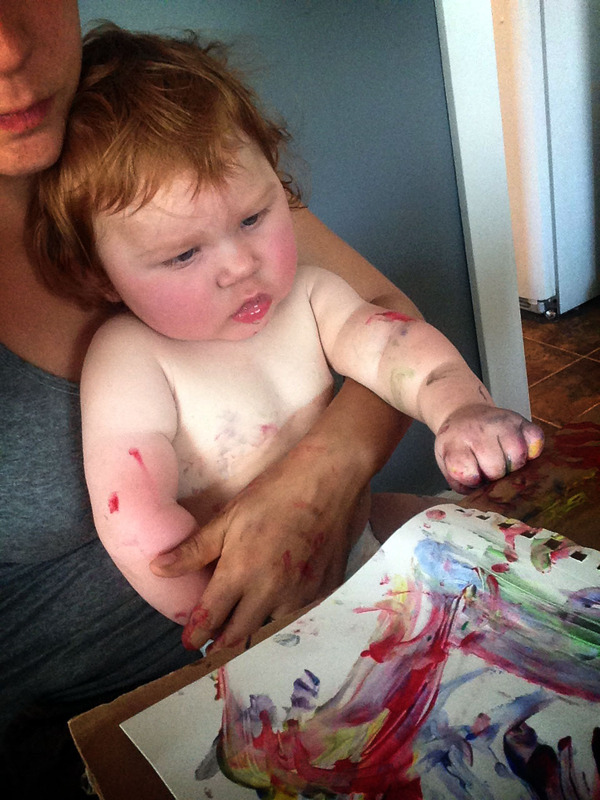 This is not a sleepy baby. This conversation happens so often that I almost find it entertaining. 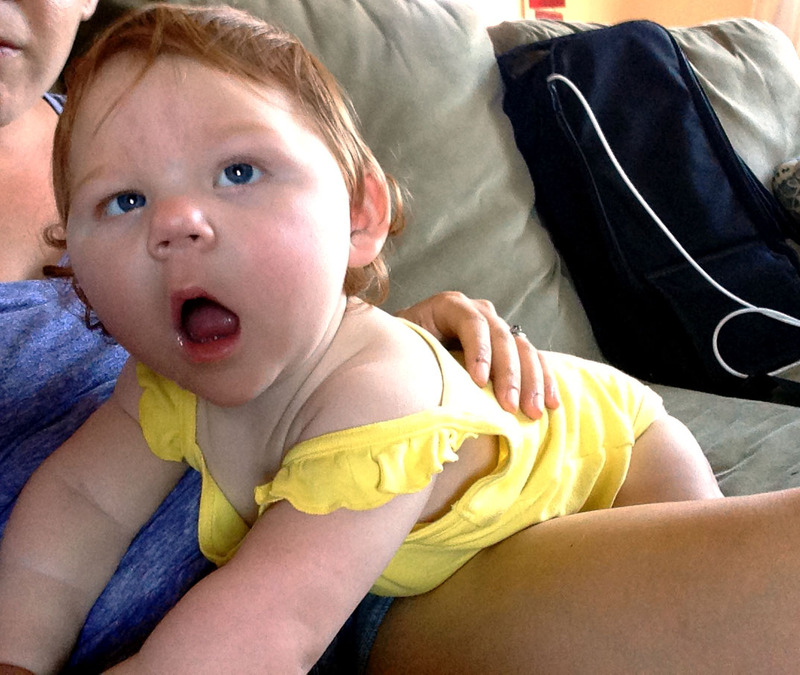 I don’t really see it, but because of Luella’s vision issues, apparently she looks tired, uh, all the time. Generally, I passively agree with whatever the other person says. “Did she just wake up?” Yup. “Is she about ready to go to sleep?” Yup. Whatever. But some of the other conversations are getting to me. People start what they consider harmless small talk, putting me in the awkward position of lying or divulging more than I’d like. I don’t often become unhinged by assumptions about her development, but it’s pretty awkward and, more importantly, a CONSTANT reminder that we often forget that people with all sorts of delays and disabilities exist. “I see they’re looking at toys/reading a book/listening to music. What’s their favorite toy/book/music? 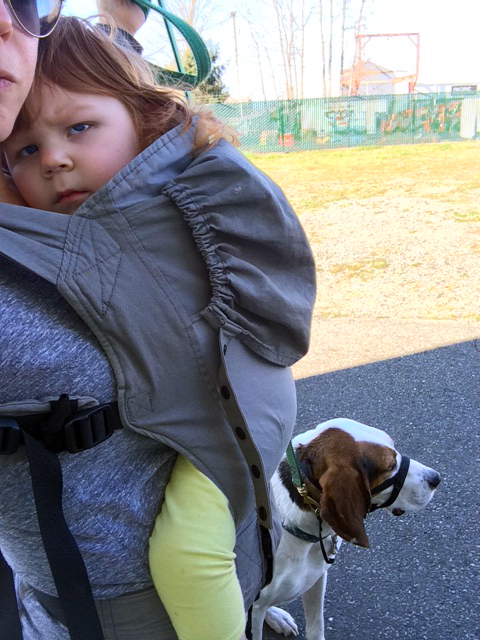 Another tip: if you ask a question and someone responds with “my child is on a different schedule/has cerebral palsy/doesn’t walk/etc.”, resist the urge to let the moment melt into awkward silence or give a pep talk (OH REALLY, you’re sure my child will learn to walk? Please show me your medical credentials.). Instead, refocus and follow up with one of the questions above. I’m realistic: I know that uncomfortable situations will continue to arise. And we (Luella, myself, and awkward-maker) will survive. But beyond just surviving, maybe we could all work on making things a little less awkward, ‘kay? After all, keeping assumptions out of the picture can make things a lot less exhausting, no matter how sleepy anyone actually is. 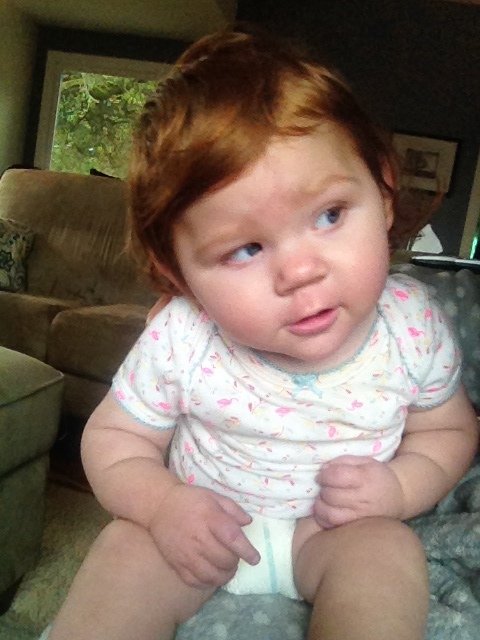 Health Update: Luella is now off of the medication that was working to keep her arms loose. Her specialists decided that it wasn’t worth it after seeing how far back it set her trunk and head control. She has dealt well with the changes and now we’re at some middle ground: better at holding up her head and slightly looser arms. 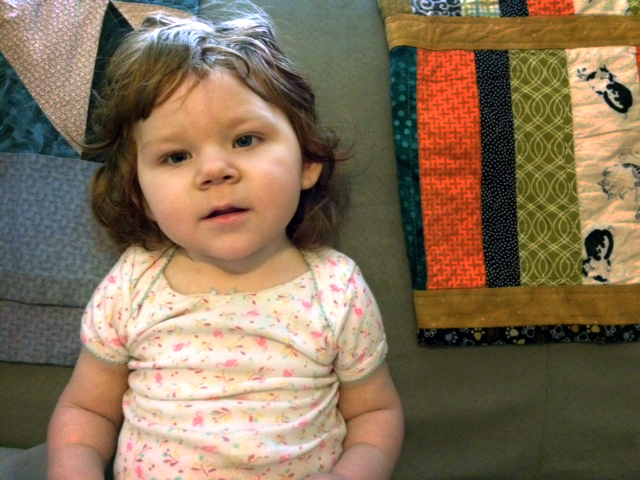 Luella also successfully recovered from her first cold EVER. 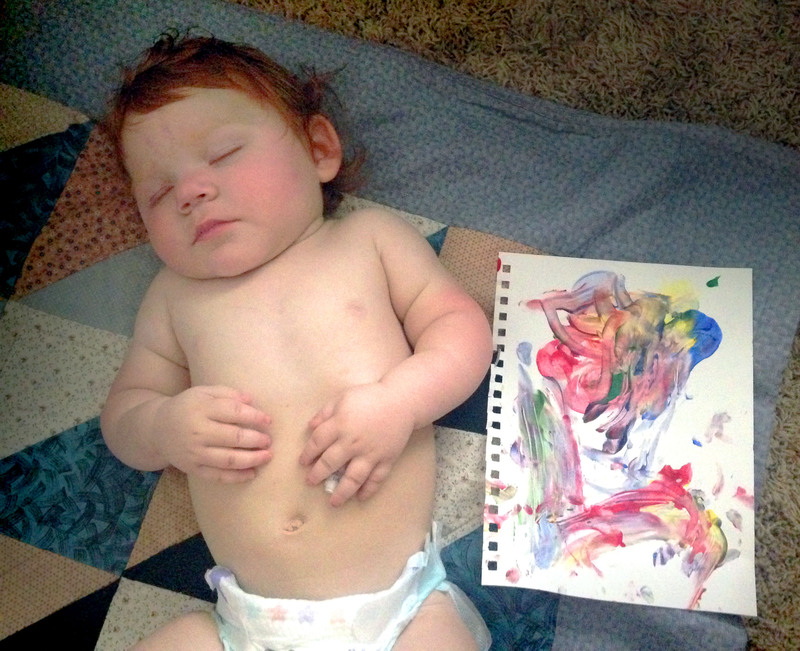 We’re thrilled to see that her body did what it was supposed to do without any complications. Hooray! She has been busy with physical therapy and playing with lots of different toys there. We are working on ordering her a chair that will allow her to sit at the dinner table and a “stander” to help her stand (duh). Despite a cold and some tummy troubles, she’s been in her usual fine spirits! When I was in my twenties, I had visions of what it meant to be in my thirties. And I spend a LOT of time talking about Other People’s Pregnancies. Despite having recently trudged through the pouring rain to fill a gas can (coincidentally, I ran out of gas in the parking lot of the Medicaid gas voucher program office which was funny/not funny), it’s the last one that causes the most issues. 95% of the time, I’m awesome. I’ll drop off ginger ale for the morning sick, ogle over ultrasound pics, and obsessively check for Facebook updates when I know someone is in the vicinity of their due date. It’s absurd! And self-defeating! But it’s THERE. When it happened a few weeks ago, I first tried employing my usual strategy of barreling through the unpleasantness. Two days in, I tested out the opposite approach: baby-focused immersion therapy, which turned out to be a sort of self-flagellation by social media. And then I just cut myself some slack. I deleted Facebook from my phone, put off talking to anyone about their pregnancy or babies for 24 hours, and turned all of my attention to loving on Luella. I connected with a local group of moms online whose children have special needs. I did some embarrassingly effective guided meditations (vomit), watched two seasons of Gilmore Girls, and took a night off to go dancing and stir up some adult-centered rowdiness. And now? I’m good. Excellent, even. I can barely remember how it all felt, even though I know I’ll be back in that resentful, irritated, grieving spot someday. But next time, I’ll skip the masochism and go straight to Luella cuddles and Youtube videos of British men telling me to “breeeeeeeeathe” over crashing waves. I’ll be ready, because when it comes to OPP? Health Update: We are still slowly increasing dosage on Luella’s new seizure medication to try to eradicate her tiny seizures. They seem to have improved, but they have to be completely gone for at least a week to call the medication a success. We’re probably down to 10-15 (very short) seizures a day. 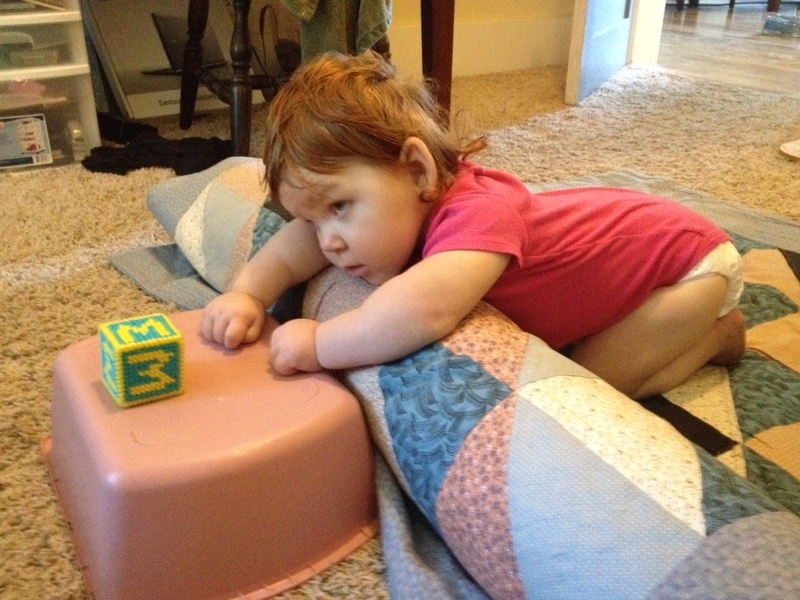 At long last, Luella has started physical therapy, which accompanies feeding and occupational therapy. 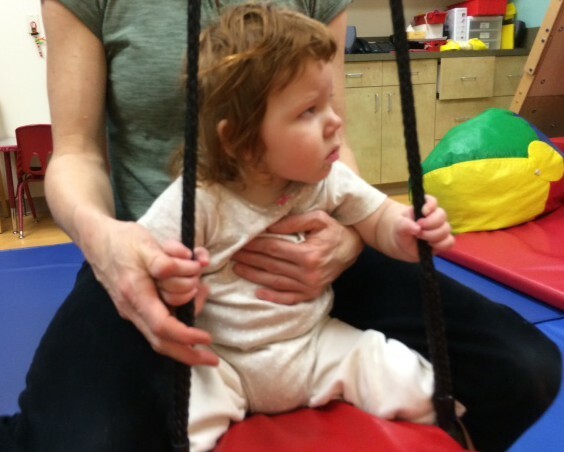 She’s working on all sorts of things with a main focus on gaining head control, which can help her to independently sit and stand on her own in the future. Physical therapy pushes her a little outside of her comfort zone, but it also involves a lot of bouncy balls, swings, and fun toys, so she’s tolerating it quite well. On the communication front, we are hearing giggles more frequently, usually while being bounced and listening to “Shake it Off”. Like mama, like daughter. We spent the afternoon manipulating a spreadsheet of our finances and talking about possible downfalls to my hastily proposed idea, ultimately concluding that I should keep my job but try to reduce my hours. After all, I didn’t really want to quit, I just wanted more time at home. 24 hours later, I sat down in a meeting with my boss to talk about reducing my hours and, um, quit my job. A long appointment, sick sitter, or injured pet (were you aware that dogs can sprain their toes?) meant a change in our carefully laid plans, resulting in scheduling-related stress usually only reserved for air-traffic controllers. But most importantly, us Making it Work wasn’t working for Luella. Sure, she only has appointments at Seattle Children’s Hospital every couple of months now, but her local therapy schedule has picked up. On top of weekly appointments, we’re supposed to be doing feeding therapy, stretches, strengthening exercises, and sensory play multiple times a day. And this may sound absurd, but sometimes I just want to enjoy spending time with her. 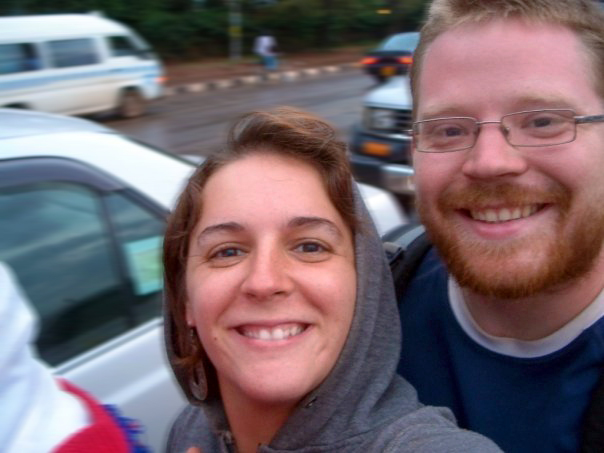 With both of us working close to full time, we constantly felt like we hadn’t done enough. Not in an “every mom feels guilty” sort of way, but in a “we are probably terrible people” way, because we sometimes weren’t even doing the minimum amount of daily work she needed to, you know, learn to eat or walk or sit. As it turns out, sometimes ill-thought-out decisions are the best decisions. I’m staying at home a lot of the time, but I also took on a few contracting gigs that are keeping me engaged. I’m getting to be involved in fulfilling projects, but I’m not so busy that I’m shoving food in Luella’s mouth with one hand while checking emails with the other. Sloppy Jenn may have been more emphatic than necessary, but it’s sort of true. I found some weird life loophole where I really can “have it all”. Of course, my “all” includes frequent trips to the pharmacy for seizure medication refills, annoying phone calls to the insurance company, and a dog that has eaten five sticks of butter this month. But it also means work meetings with creative go-getters, spending my mornings dancing to Taylor Swift with Luella, AND having homemade pizza for dinner. It’s not necessarily the “all” everyone is looking for (I hardly EVER have butter when I need it), but you know what? I’ll take it. 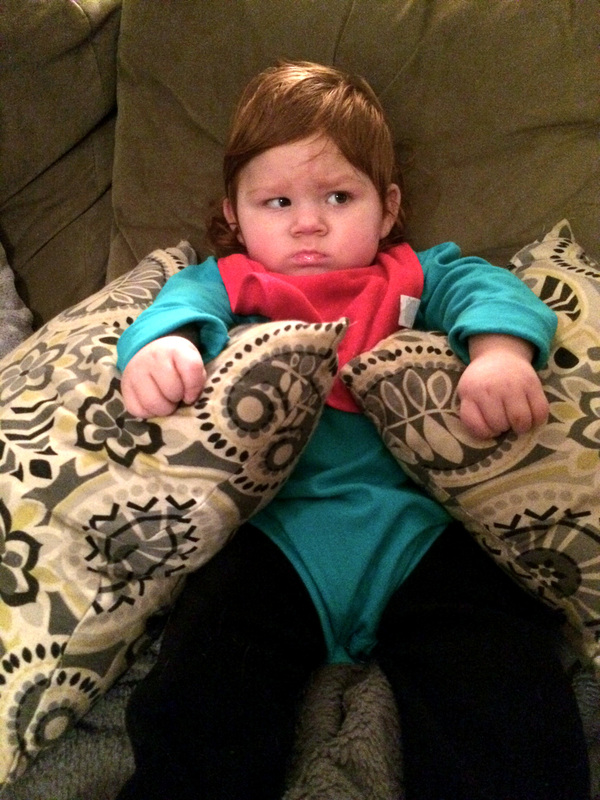 Health Update: Luella has begun taking a medication, Diazepam, to relax her stiff arms. It’s helping! After a week or so of her being way too relaxed EVERYWHERE (think Weekend at Bernie’s), she’s starting to regain some of her bodily control. She still isn’t using her arms for anything purposeful but it’s made it easier for us to do the therapy activities we need to do that may help get her there. We also began a new medication to get her seizures under better control. The medication has very few side effects with the exception of an extremely rare but life-threatening rash. We’ll be checking her out for rashes everyday and I fully expect to have a few trips to the doctor or ER this winter to get some rashes checked out. 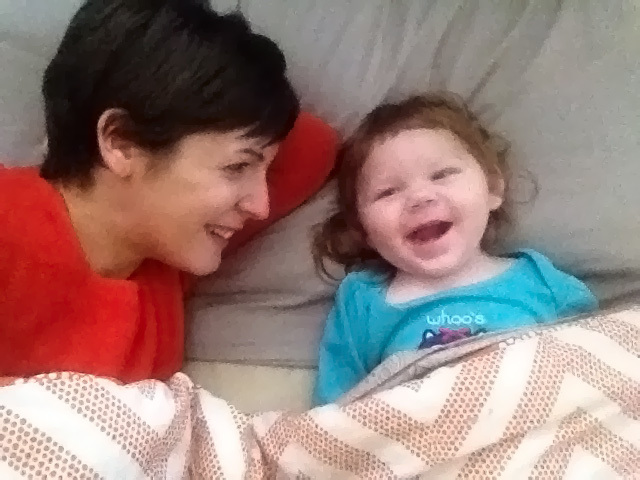 Luella is babbling much more often and has said “dada” and had her first bout of laughing. She’s quick to smile, likes observing other kids playing, and “talks” and watches the cat, who is newly obsessed with her! Every night before we begin eating dinner, Mike and I take a moment doing the one thing keeping our relationship intact: turning on music to drown out his chewing. It’s not because Mike is a particularly noisy eater. In fact, as a result of my daily critiques of his chewing habits (“The fish is already dead, it’s not necessary for you to gnash each bite ONE MILLION TIMES before you swallow!”), Mike probably eats more quietly than most. It’s because of misophonia, a syndrome that causes people like myself to hate some everyday, otherwise normal noises. A hatred that makes these seemingly unavoidable noises completely intolerable. I like to think it’s helped him appreciate the little things. How many other people can find such joy in eating Pringles on the couch, in the middle of the living room, when the wife is away? Because of this, I had hoped that Luella wouldn’t have any issues with sound. Unfortunately, while her issues are very different, that hasn’t been the case. If you’ve spent any amount of time with Luella, you’ve probably noticed her aversion to loud noises. In fact, the noise doesn’t even need to be particularly loud. Silverware clanking on plates, sudden coughs, and the Facetime ring tone all cause her to flinch and suddenly jerk her upper body to the side (and for her to be on the verge of tears by the time my mom answers video calls from us). I questioned Luella’s neurologist about this reaction a few months ago and she assured me they were a fairly typical startle response to loud or sudden noises for a kid with Luella’s neurological issues. But three weeks ago, we were at a regular neurology check-up when my chair squeaked and Luella nearly jerked herself out of my arms. An EEG confirmed her suspicions. In terms of seizures, this is the best case scenario. 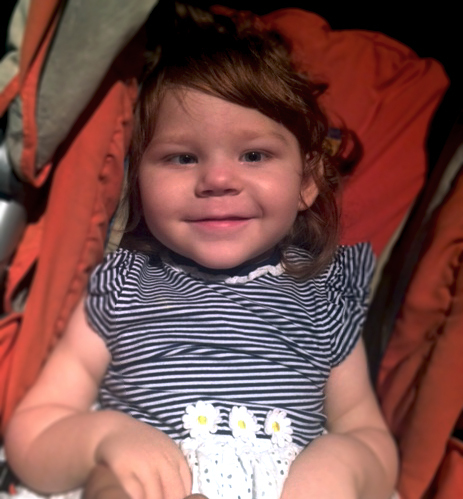 With an increased dose, the anti-seizure medication Luella is already on could help to stop them completely. Because they are so short, lasting only about 5 seconds, the seizures aren’t doing any developmental damage. And since she isn’t standing, walking, or driving, there isn’t much risk of her falling or injuring herself. 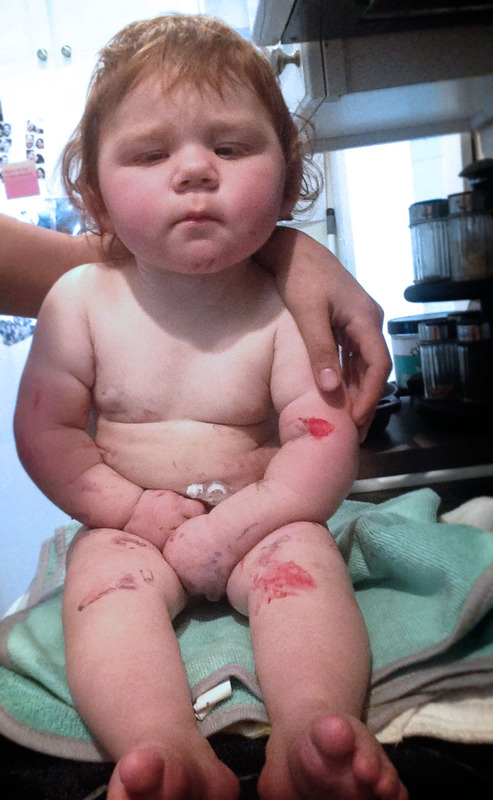 We’re hoping that these seizures are resolved quickly and without changing medications. I guess we’ll add sudden clanking and coughing to the list of noises that are frowned upon in our home. And Mike will be able to take delight in smacking his gum, mashing disgusting bananas around his mouth eating bananas, AND loudly shutting kitchen cabinets while Luella and I are safely out of the house. Health Update: We’ve been using the term for quite some time, but we’ve officially adopted the label “cerebral palsy” to talk about some of Luella’s issues. Cerebral palsy is an extremely broad term that describes disorders related to development of movement and posture as a result of damage to a baby or infant’s developing brain. Or something. Seizures, feeding difficulties, and visual impairment are all common for kids with cerebral palsy. So in CP world, Luella is actually quite typical! In other news, Luella has begun taking Diazepam, also known as Valium, to help with the stiffness in her arms. This stiffness is a result of CP and it hasn’t shown any improvement through stretching and exercises. The Valium can help relax the muscles in her arms, but also might relax her muscles EVERYWHERE, so we’ll be working extra hard on getting her strong. 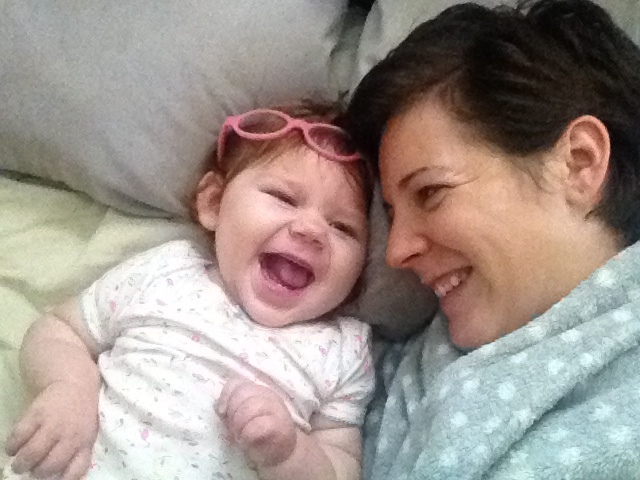 Luella was also prescribed glasses, which has been my favorite negative medical development to date. Get ready for an adorable, bespectacled Luella to grace your computer screens very soon! During a weekend-long decluttering mission of epic proportions, I found a few tubes of finger paints hiding at the back of my craft shelves. Luella and I spent this morning listening to Lauryn Hill and painting for the first time, then cleaning and recovering from her creative adventure. I’d like to begin by stating that while I don’t really know what the space-time continuum is or how it works, I’m going to apply the concept here liberally and recklessly. Judgey physicists, you’ve been warned. I do not apologize. So. I was recently looking through some old files at work and stumbled across a copy of our building’s purchase agreement, signed on March 20, 1989. March 20, 1989 was also Mike’s 7th birthday. This space-time continuum(?) sort of thing BLOWS MY MIND. I mean, I now know what my husband and my former coworkers were doing on the EXACT SAME DAY, 25 years ago. My former coworkers were all, “Ho hum, let’s sign these papers,” and Mike was like,”WOOO kid birthday,” and no one had a thought that the two events would collide in my hands two decades later. Put that in your “things to think about while high” folder, my friends. Time is sort of magic to me. Which is why I expected it to take on memory-erasing powers over the past year, letting me retire the experiences of last summer. I’d hoped that with some distance, my pesky brain would override the old memories with newer, less criminally awful ones. 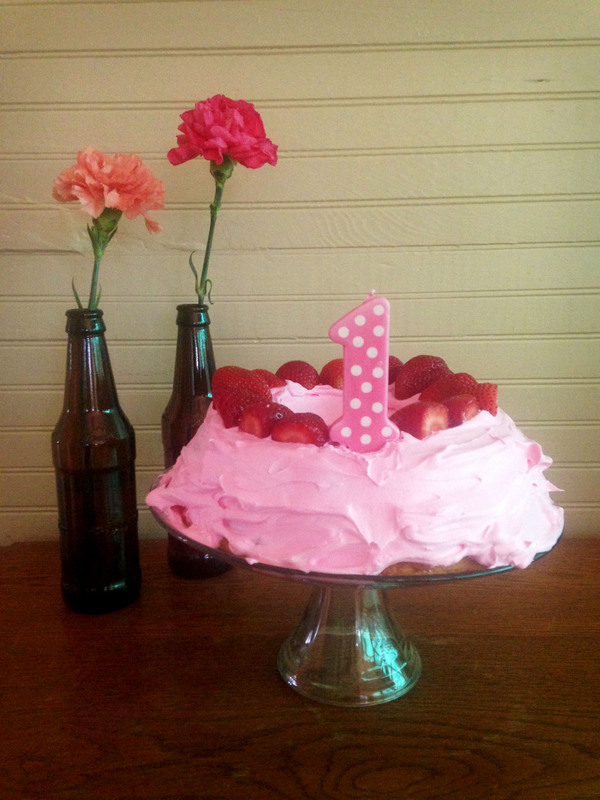 July 5 rolled around again this year and we celebrated Luella’s birthday and existence, which has been no less than miraculous (and I’m not even a “miracles” sort of person!). So it came as a surprise when July 6, 7, 8 and all the days that followed have felt less celebratory. Yeah, heaps of gratitude are there. But occasionally, I’m brushing my teeth and a moment of all-consuming doom comes crashing down along with the realization that we were in the hospital on this day last year and now, even though WE aren’t at the hospital, SOMEONE is, and isn’t that awful too?!?! I suppose it was ambitious to believe that every day from July 5 to August 19 would be a Chicken Soup for the Soul-worthy experience, filled with a renewed appreciation for life. But I really thought that’s what would happen. As it turns out, this summer is less about trying to replace last summer and more about accepting the coexistence of experiences. There is no such thing as “cancelling out” your bad days, because the good stuff doesn’t replace the lame stuff. It’s all still going to be there, although it’s nice when the scales are tipped in the right direction. I’m embracing this weird summer (which mostly involves embracing last year’s weird summer) in part by looking at lots of Luella’s baby pictures and reading through emails I sent to friends while we were still at the hospital. A year ago today, I emailed my mom, thanking her for writing me a list of times Friends reruns played on every channel at the hospital. 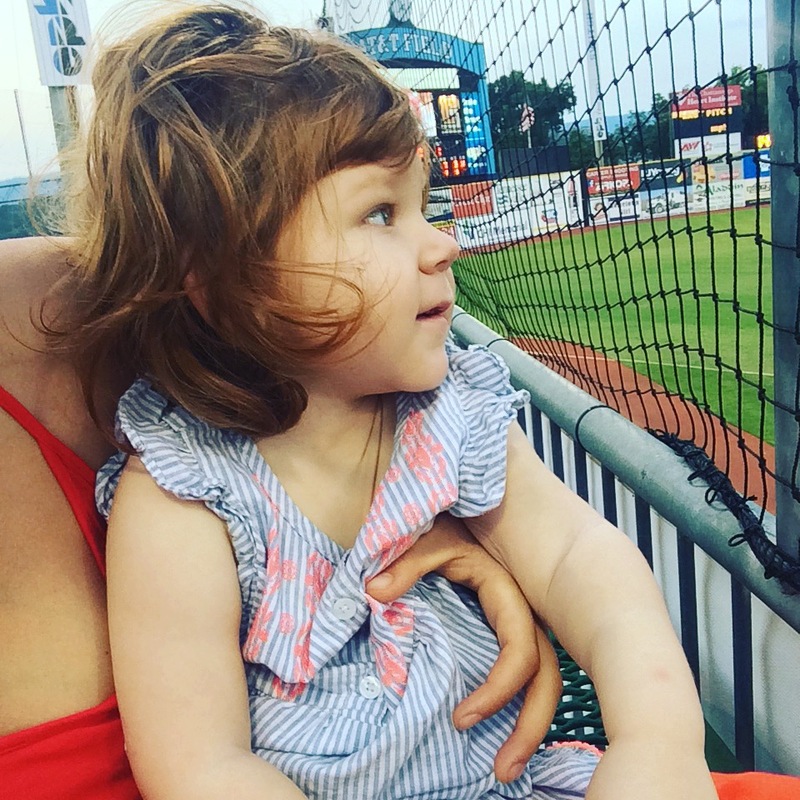 Because that’s what I was doing at this time last summer: sitting in a dark hospital room next to my heavily-tubed baby, machines beeping as they monitored her every function, watching Friends reruns as nurses shuffled in and out of the room. 365 days later, I suppose the space-time continuum isn’t so bad after all. 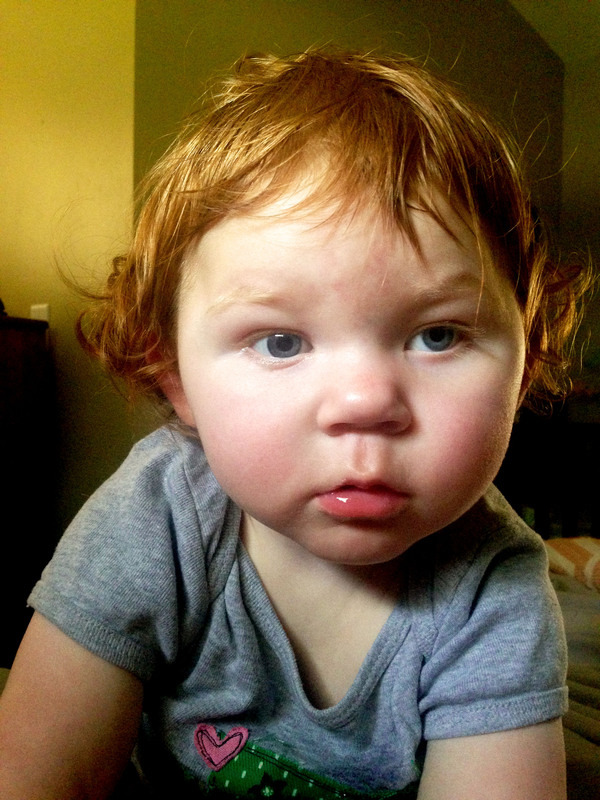 Health Update: Luella is doing well! She is tasting small bits of food by mouth as we try to reduce her oral aversion. She is starting to babble a bit. 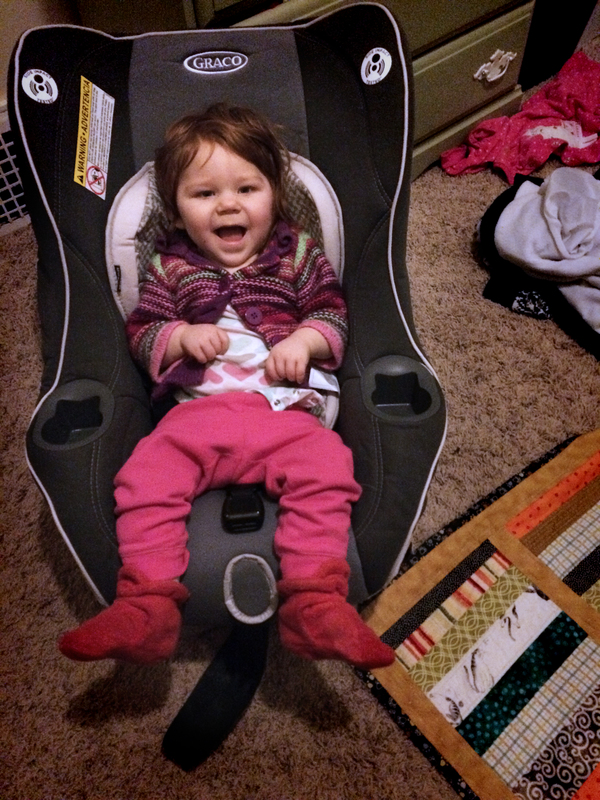 She really loves the “s” sound, listening to Raffi, and sitting in her new chair! She is weaning off one of her seizure medications and she will see her neurologists and ophthalmologist in the next few weeks.